Russian cosmonaut Alexander Skvortsov (center), Soyuz commander; NASA astronaut Steve Swanson (left), Expedition 40 commander; and Russian cosmonaut Oleg Artemyev, flight engineer, conduct a suit leak check in their Soyuz TMA-12M spacecraft ahead of a return home from the International Space Station set for Sept. 10, 2014. A trio of space travelers will return to Earth tonight (Sept. 10) to end a months-long expedition to the International Space Station, and you can watch the landing live online. American astronaut Steve Swanson and Russian cosmonauts Alexander Skvortsov and Oleg Artemyev are due to land their Russian-built Soyuz space capsule on the Central Asian steppes of Kazakhstan at 10:23 p.m. EDT (0243 Sept. 11 GMT), after more than five months in orbit. You can watch the space crew's landing on Space.com in a live webcast provided by NASA. The webcast will include a series of broadcasts for each stage of the landing. The landing webcast begins at 3:15 p.m. EDT (1915 GMT) with a farewell ceremony, then resumes at 6:45 p.m. EDT (2245 GMT) for live views of undocking. The landing coverage will begin at 9:15 p.m. EDT (0115 GMT). Swanson and his crewmates launched to the International Space Station on March 25, with Swanson commanding the outpost's Expedition 40 mission. 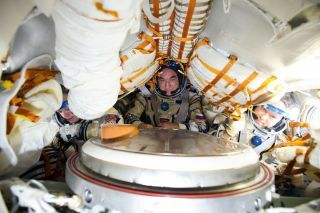 Three other station crewmembers — NASA astronaut Reid Wiseman, cosmonaut Maxim Suarev and German astronaut Alexander Gerst — arrived at the station in late May. "We've accomplished a lot. We've had a lot of fun," Swanson said Tuesday (Sept. 9) as he handed control of the space station over to Suarev. "This was a team effort. We got together and did it as a team. During the Expedition 40 mission, the station astronauts and cosmonauts watched over a flurry of robotic cargo ship arrivals and departures by Russian, European and commercial American spacecraft. Skvortsov and Artemyev performed two spacewalks, and tossed a tiny Peruvian satellite into space on their second excursion. Swanson made a bit of space history by becoming the first astronaut to post Instagram photos from space. And then there were the science experiments. Many, many experiments. "We actually set the record for the number of hours of science in a week," Swanson said. The return of Swanson, Skvortsov and Artemyev tonight will mark the official start of Expedition 41 on the International Space Station. Suarev will command that mission. Later this month, on Sept. 25, three new spaceflyers will launch to the space station to join the Expedition 41 flight. That launch will ferry NASA astronaut Barry "Butch" Wilmore and Russian cosmonauts Elena Serova and Alexander Samoukutyaev to the station. Serova will become Russia's fourth female cosmonaut to fly in space when she launches this month. She will also be the first female Russian cosmonaut to visit the International Space Station. The International Space Station's Expedition 40 crew poses for a portrait in the outpost's Harmony node. They are (clockwise from bottom): NASA astronaut Steve Swanson (bottom), commander; Russian cosmonaut Alexander Skvortsov, European Space Agency astronaut Alexander Gerst, Russian cosmonaut Maxim Suraev, NASA astronaut Reid Wiseman and Russian cosmonaut Oleg Artemyev, all flight engineers. The $100 billion International Space Station was built by more than 15 different nations and is overseen by the space agencies of the United States, Russia, Europe, Canada and Japan. It has been continuously occupied by rotating crews of astronauts and cosmonauts since 2000. NASA has relied on Russia's Soyuz space capsules to fly American astronauts to the space station since the retirement of the U.S. space shuttle fleet in 2011. Visit Space.com tonight to follow the live landing coverage of the Expedition 40 crew.